Lots of people are intimidated by downtown but with a little guidance, we promise that you soon will be an expert navigator of downtown streets. With new applications like ParkMobile and Uber, plus alternative methods of transportation like Greenlink and B-cycle, it’s easier than ever to get around. And don't forget, unlike other areas of town, downtown is very walkable... whether you’re at street-level or down in the tunnels. Click here for street closures related to both construction and special events. If you'd like to sign up for our weekly Street Closures email, please click here. There are affordable parking options-- garages, surface lots and on-street parking-- convenient to your destination, whether it be a restaurant or event. On-street, metered parking is available during the day on most downtown streets. You can park up to 3 hours and after that, you need to move your car. The meters accept cash, credit cards and pay-by-phone; hourly prices vary depending on location. Meters are FREE after 6 pm Monday-Saturday and all day Sunday. DO NOT park is valet zones or commercial zones (marked with red meters or red striping on the street). Please always read the signs before you park! Parkmobile, the City's pay-by-phone program, really makes parking at Houston's meters easy (we use it all the time)! Drivers can sign up at www.parkmobile.com. You can find more parking and getting around info on our custom Downtown Interactive Parking Map. Heading out in Houston? Give the car a brake and let the city’s 22.9 miles of METRORail handle all of the legwork. One-way tickets cost $1.25 and all-day passes are only $3.00 and can be purchased using cash or credit at all rail stops. Discounted fares are available to students, seniors, Medicare cardholders, the disabled and jurors. The 13-mile Red Line, offers convenient and fast service between the Northline Transit Center/HCC, Burnett Transit Center, UH-Downtown, the Downtown Transit Center, Midtown, Museum District, Texas Medical Center and NRG Stadium and the Fannin South Park & Ride. The 6.6 mile Purple Line travels through the southeast community connecting Downtown, Texas Southern University, the University of Houston, and the Palm Center Transit Center. The 3.3 mile Green Line travels along Harrisburg through the historic East End connecting downtown, the Convention District, EADO/BBVA Compass Stadium, and Altic. METRO also offers several types of bus service in Houston. Local Bus service runs mostly on city streets, stopping at every other corner along its route. Local bus route fares are $1.25. METRO Park & Ride service is offered for long distance commuting. METRO operates 28 Park & Ride lots to provide bus service to key destinations in the service area. One-way fare falls into four zones based on the distance a bus travels, ranging from $2.00 to $4.50; the one-way fare to The Woodlands Express is $6.00. In addition to cash, you can use your METRO QCard which acts as an electronic wallet for METRO riders. This unique card contains a computer chip that stores your cash balance directly onto your card. Fares are automatically deducted from your card each time you ride, just like a debit card. The METRO Q®, which stands for “quick,” also provides free transfers and tracks your progress toward earning five free trips for every 50 paid trips. Just touch your card to the METRO Q® Box on your bus or at METRO Rail platforms and you’re on your way! For more info, click here. For information on any of METRO’s services, call (713)-635-4000 or visit www.RideMetro.org. Houston BCycle is a "bike sharing" program that shows Houstonians how easy, efficient, functional and practical bike sharing can be! See how it works. Zipcar Houston is a “car sharing” program which helps keep fewer cars on the road and less nasty stuff in the air. Imagine the convenience of having a car parked right around the corner, without any of the hassles or costs. That’s Zipcar! There are eight convenient locations in downtown Houston alone and many more across the city and even the country. Members can drive cars by the hour or day and can choose from a variety of vehicles including MINIs, hybrids, trucks and more. Zipcar realizes every customer’s car use and budget will be different, that’s why there are multiple membership levels, all of which require a $25 one-time only non-refundable application fee. Joining Zipcar is easy- just apply online, make a reservation, unlock a vehicle with your Zipcard and drive away. The best part about it is gas and insurance are included with every ride! Check www.zipcar.com/houston for most up-to-date rates. George Bush Intercontinental Airport/Houston (IAH) is presently served by 21 scheduled passenger airlines and five passenger terminals. Currently, IAH ranks 5th in the United States among U.S. airports with scheduled non-stop domestic and international service to over 170 destinations. There are 12 all-cargo airlines at IAH, handling more than 419,205 metric tons of cargo in 2012. In 2013, nearly 40 million passengers traveled through IAH with more than 650 daily departures. William P. Hobby Airport (HOU) is presently served by five scheduled passenger airlines. Currently, Hobby Airport is the 33rd busiest airport in the U.S. for enplanements with nonstop or direct service to more than 40 destinations throughout the United States. In 2013, more than 11 million passengers travelled through Hobby Airport. Currently only U.S. destinations are served by Hobby Airport, however, international service will begin in 2016. Ellington Field, a joint use civil/military airport, was acquired by the City of Houston in 1984 and now supports the operations of the United States military, NASA, and a variety of general aviation tenants. The airport is home to the annual Wings Over Houston Airshow and is also the place where many of the astronauts from the world-renowned Johnson Space Center receive their ongoing space training. Relax and enjoy the ride to and from Houston airports! Choose from non-stop and shared-ride services for your airport ride to and from William P. Hobby Airport (HOU) or George Bush Intercontinental Airport (IAH) with SuperShuttle. Or, choose luxury with premium airport ride services with ExecuCar. Mega Bus provides high-quality, express bus travel to and from Houston from $1 and many other very affordable fares (plus a 50 cent booking fee) via the Internet. Megabus.com operates daily, convenient, intercity bus services on state-of-the-art, climate controlled, double decker buses with free WiFi, power outlets, clean restrooms, reclining seats and overhead lights. One piece of luggage, not to exceed 50 lbs, and a small under seat item are permitted. All Megabus.com double decker buses are wheel chair accessible and green certified. Limited number of $1 seats; book early for best rates. Megabus.com serves the following cities to and from Houston: Dallas/Fort Worth, TX; San Antonio, TX; Galveston, TX; and New Orleans, LA. The downtown Houston stop is located in the parking lot at 815 Pierce (@ Travis, across from the METRO Downtown Transit Center). Call 877-462-6342 for more information or seats can be booked at us.megabus.com. NuRide is the nation’s largest rewards program for individuals who participate in commute alternatives by carpooling, vanpooling, biking, walking, telecommuting and taking public transportation. NuRide allows commuters to plan trips online and get rewarded for riding together. Like booking an airline ticket, users sign up online -- where they want to go, when they want to go, whether they want to ride or drive, and other criteria. NuRide can be used once or daily, one-way or round-trip. NuRide requires individuals to sign up with their company email address which allows the program to verify each rider’s identity so users can feel safe and secure with everyone in the system. There is even a rating system to find out how other NuRiders have rated others. ExxonMobil, Reliant Energy and Harris County have already signed up for this service. For more information or to sign up, visit www.nuride.com. Downtown is very accessible with a multitude of ways to get in and out of the city. Below are recommended ways into downtown or just Google Map it! Exit Smith Street to the west side of downtown for the core business district, the theater district and the entertainment venues in the historic district..
Exit Hamilton to the east side of Downtown near the Ballpark. Exit to I-45 and take the McKinney exit or the Dallas/Pierce exit. Either one takes you across downtown to streets going into the heart of the city. Exit US 59 southbound, take Chenevert exit (be in left-side lane and watch for exit well before you cross I-H 10). Take IH 45 South and exit Dallas/Pierce or McKinney. Exit Lorraine, take Lorraine westbound to Hardy, take Hardy southbound to Downtown. Exit Milam Street to the west side of downtown for the core business district, the theater district and the entertainment venues in the historic district. Exit McKinney Street to the core business area. Exit Dallas/Pierce to Jefferson and cross the south side of downtown. West on St. Joseph Parkway; merge left to IH 45 North. Exit Scott to Pease or St. Joseph Parkway. If your destination is the theater district or the core business area turn right on Travis or Louisiana. Merge to US 59 North, take the Polk Street exit and turn left at the first traffic signal which is Polk Street taking you past the Convention Center, Hotel and Arena construction sites and continue to the west side of downtown. Downtown Houston has a complicated Tunnel System 20 feet below ground that is more than 6-miles long. Having started out years ago as a tunnel between two downtown movie theaters, today it includes fast food restaurants and service retail and connects 95 city blocks. Only Wells Fargo Plaza and McKinney Garage on Main offers direct access from the street to the tunnel; otherwise, entry points are from street-level stairs, escalators, and elevators located inside office buildings that are connected to the tunnel. In addition, a skywalk system also connects many of the buildings. Regarding leasing space in the tunnel, please note that each portion of the tunnel is owned and operated by the building above that section of the tunnel. Most available spaces have leasing signs in the windows, so if you are interested in tunnel leasing, the best course of action is to walk the tunnels (would recommend doing this during lunch time) and gather contact information. The Downtown District is not responsible for tunnel leasing, nor do not keep an updated list of available space for the tunnels. $6 taxicab rides anywhere downtown by any taxicab company. The $6 taxicab fare applies to a trip, pick-up and drop-off, anywhere within the Downtown District, bounded by I-45, I-10 and U.S. 59. Now with double the amount of cab stands downtown and the ability to hail a cab when you need it, we’re making those shorts trips easy and affordable. Six in the City only applies when cabs are hailed in person, it does not apply when rides are booked online. Go to the nearest hotel.... there is always a queue! Uber is an easy way to request a safe, reliable, and affordable ride within minutes. The Uber mobile app connects riders with reliable transportation options such as drivers of vehicles for hire and ridesharing services at the tap of a button. Catch a friendly, affordable ride whenever you need one. The Lyft app matches you to nearby drivers so you can get a ride in minutes. Houston Wave operates Thursdays 6pm-1am, Fridays & Saturdays 6pm-3am, and Sundays 4pm-12am. You can catch them Downtown by calling, emailing, or app requesting a pick-up anywhere on the City approved downtown route. They will text/call when the jitney is approaching. 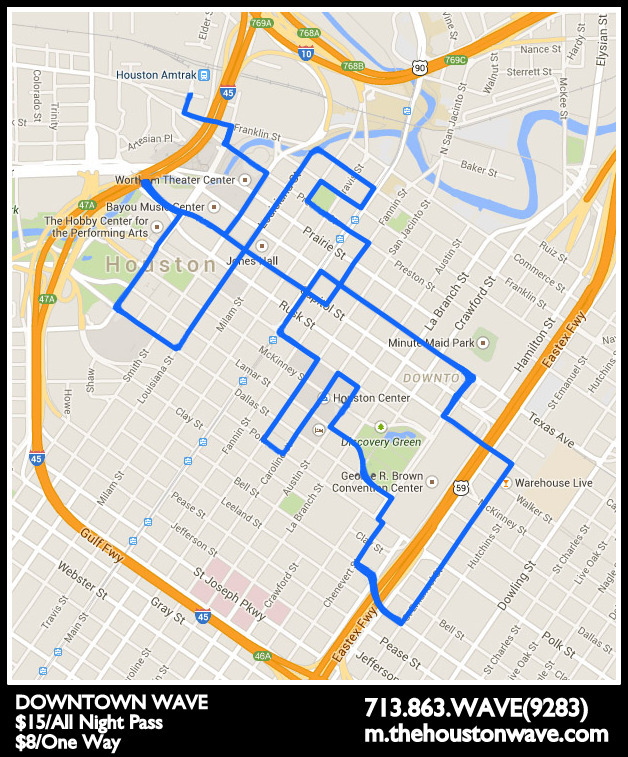 Routes go as far West as Sage, East as BBVA Stadium, South as University Blvd, and North as 20th Street. The fare is $15/per person for the whole night. You may get on/off as many times as you like along all routes during route times. RYDE uses 5 passenger electric shuttles to transport people around downtown. They work with national brands, local businesses and city governments who sponsor the service, making it FREE for the public to ride. To request a ride, text 281-610-2258 with your name, pick-up/drop off location and number of passengers. Tips are highly encouraged. 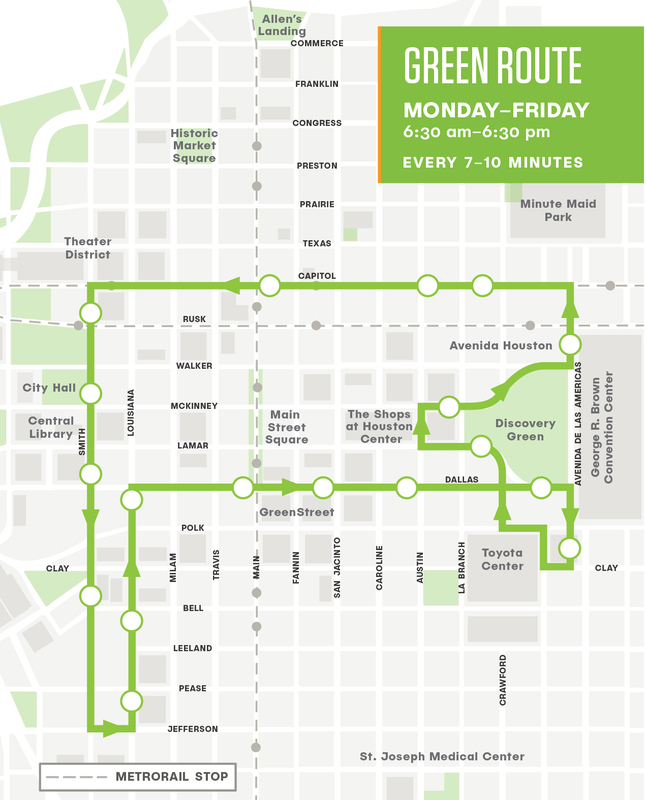 Beginning Sunday, January 21, Houston’s free, clean-operating Downtown Circulator launches updated routes, extended hours and a new look. Funded by the Downtown District and Houston First Corporation, and operated by METRO, Greenlink is a free, efficient and environmentally friendly transportation option for Downtown residents, workers and visitors. Since service first launched in June 2012, Greenlink has had more than 1.34 million riders. 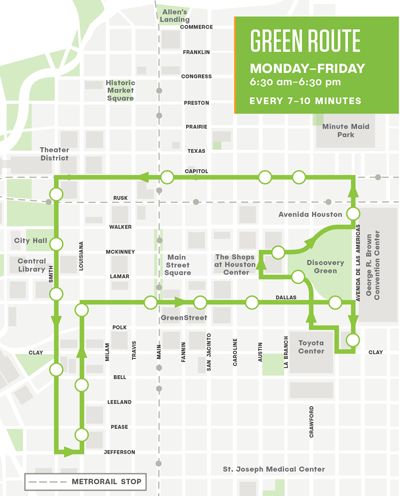 Greenlink’s updated routes and extended hours are a direct reflection of Downtown’s growth and development. The new routes touch many of Downtown’s new residential and hotel projects and better serve neighborhoods such as the Theater and Ballpark Districts. Connecting Avenida Houston and Main Street to the dense office market in Downtown’s southwest corridor, the Green Route will shift two blocks north to Capitol Street to better service residents and guests of the new residential properties and hotels that have opened in northern Downtown over the past year. Its route will also be permanently altered to accommodate frequent detours along Avenida de las Americas, a thriving new entertainment destination. The buses will stop at the north and south ends of the George R. Brown Convention Center (GRBCC), and will also service a covered stop at the Avenida South Garage. The Green Route operates weekdays from 6:30 a.m. to 6:30 p.m., with buses every 7 minutes during peak morning and afternoon rush hour and during the lunch hours and 10 minutes during off-peak. 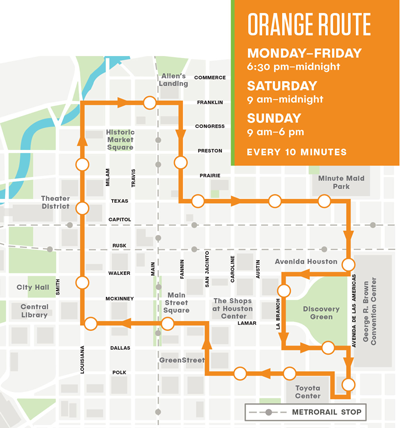 The Orange Route, which launched in April 2016, will continue to provide service between major Downtown destinations including the Theater District, Historic Market Square, Minute Maid Park, Avenida Houston, Discovery Green, GreenStreet, Main Street Square and City Hall. This route will expand its hours and will now operate Monday through Friday from 6:30 p.m. to midnight, Saturday from 9 a.m. to midnight and Sunday from 9 a.m. to 6 p.m., with buses every 10 minutes. 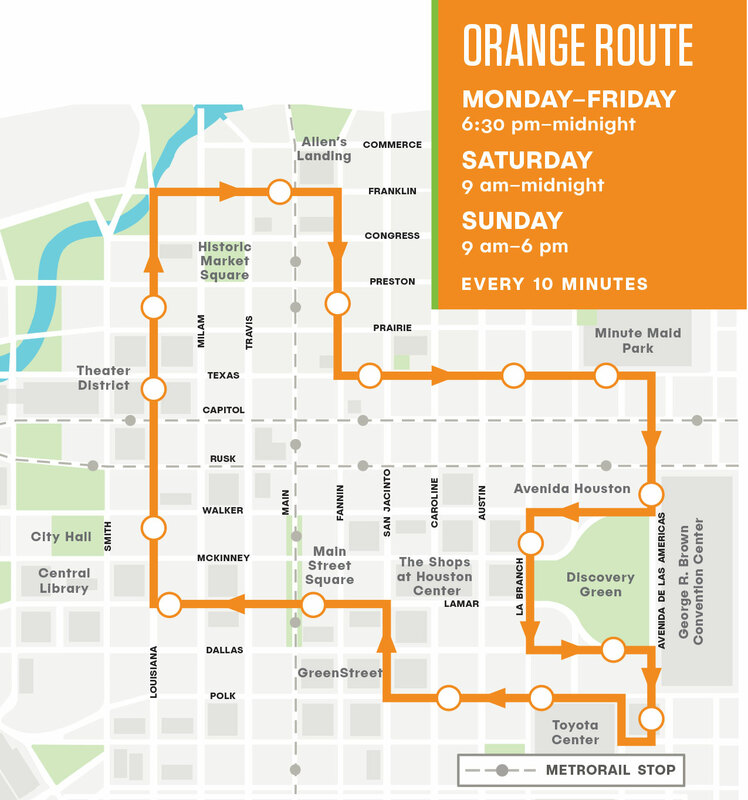 The Orange Route will also permanently shift and loop around Discovery Green, with stops at the north and south ends of the GRBCC and a covered stop at the Avenida South Garage. One of the many benefits of being Downtown is that you can get around without a car—Greenlink is one of many transportation options for those who choose Downtown to live, work and stay! The buses run on Compressed Natural Gas (CNG), making them a cleaner transportation alternative.